Limited Time Offer, Hurry While Supplies Last! All our lives, we are taught how to live and appreciate those that are close to us. However, no one prepares us for the loss of a loved one. When a loved one departs, we are left shuttered, broken and deeply hurt. The void left by the loss of a loved one cannot be measured, filled or explained but we soldier on in the hopes of one day reuniting with them. Life isn't always what it seems. Although there are painful bits that leave us broken and empty, there always remains a silver lining to the dark clouds. Your loved one might have said goodbye to the physical world but they've become something greater. Their farewell means that you've automatically gained a guardian angel. The pain may linger on for as long as their memory is alive, but an engraved piece of jewelry will always remind you of the bigger picture. 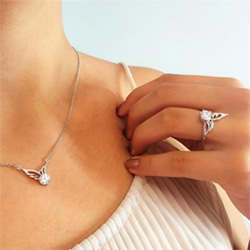 What Makes the Angel Jewelry Special? Lindastars.com is an online jewelry store that is devoted to walking with those who have lost their loved ones. By designing unique and meaningful pieces of the angel jewelry collection, we are comforted and reminded that we are not alone. There are certain unique aspects that make the angel jewelry at Linda's stars online shop unique. For starters, all the pieces are engraved and designed in a significant way. The comforting quotes and angel wings will be a constant reminder that your loved one is watching over you at all times. This is especially encouraging when you feel sad, alone and blue. The perfectly shaped angel wings on your silver pendant will instantly remind you that, every day, their angel wings lovingly engulf your life. All the pieces of jewelry in this personalized online store are made of high-quality material. This gives you value for your money and guarantees durability. You can wear your favorite bracelet, earrings or angel necklace every day for as long as you need to without worrying about the jewelry fading or breaking. This is only an added feature that goes a long way in taking care of our wounded spirits. Linda's stars guarantee that your angel jewelry lasts for an extended period of time. Another perk that makes this unique jewelry store a favorite among many is the fact that our accessories come in all shapes and sizes. This means that you will find the one that matches your preference, style, preferred quote, size and even skin tone. What's more, these are designed for various uses. If you need the angel wings or meaningful quotes close to your heart, a pendant and chain will suit you best. This way, the soft feel of the pendant will be a constant reminder that your loved one is indeed alive in your heart. The world is full of possibilities. All that you need is to believe and trust that inner voice that makes everything alright. These meaningful pieces of jewelry are also designed in the form of key holders, bracelets, earrings and rings. This gives you the freedom of choice. If you wish, you can choose to own them in all forms in order to strengthen your connection with your departed loved one who's now a guardian angel. Enjoy the peace and in the assurance that comes with these sophisticated, casual and semi-casual well-designed pieces of accessories wherever you go. Some are artistically engraved with gems to add that special touch you need in your life. These can even be worn for more sophisticated events. Others are plainer in design and hence suitable for all occasions. If the bohemian look appeals to you, you'd be pleased to know that there are angel accessories and jewelry designed with this in mind. Goodbyes are not forever. They are only the beginning of a new chapter. Your loved ones may no longer exist in the physical realm but they have gained wings. They now walk beside you as your guardian angel. You can actually feel and hear their gentle whispers if you pay close attention to your surroundings. That profound whistling of the wind, that random raindrop on a sunny day, the fluttering leaves and the inert wave of peace in the middle of a storm. Let the angel jewelry collection soothe your pain.